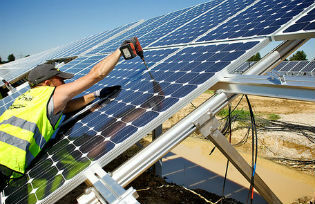 Germany is well on its way towards having a predominantly green electricity supply. The transition from nuclear and fossil-fuel electricity to using renewables is happening faster than anyone had anticipated. This is a success, but there is a downside: it is hugely expensive. The horizontal black line depicts the approximate maximum demand at any time, which is about 85 gigawatts (this will not change much in the future). 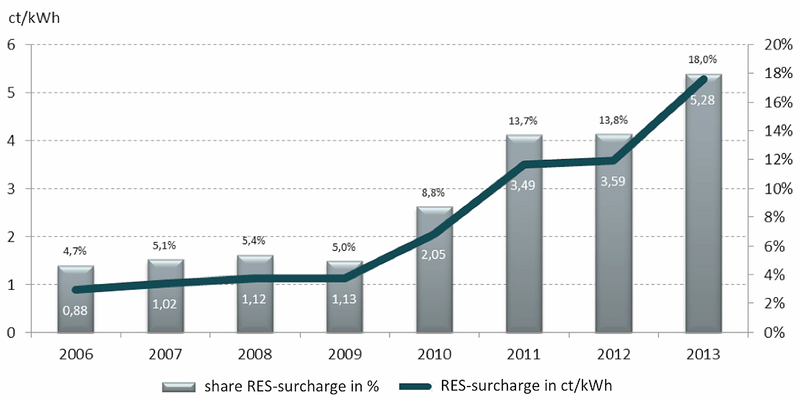 This shows that installed renewable capacity is now already more or less equal to maximum demand. On a very sunny and windy day, renewables are now capable of meeting the demands of the entire country. Early in 2013, the then-minister of environment Peter Altmaier mentioned the staggering amount of €1 trillion as the potential cost of the overall transition. This relied on a quick-and-dirty back-of-the-envelope calculation, which raises many questions and was never confirmed, but it does give a feel for the order of magnitude. The end-users – and thus the voters in Germany – are starting to feel the pain. Second, renewable power is suppressing electricity wholesale prices – essentially because they are cheaper to run per unit of power, which under the rules for calculating the wholesale price tends to bring them down across the board. This means that the revenues for conventional power plants are low and no longer cover the investment costs. 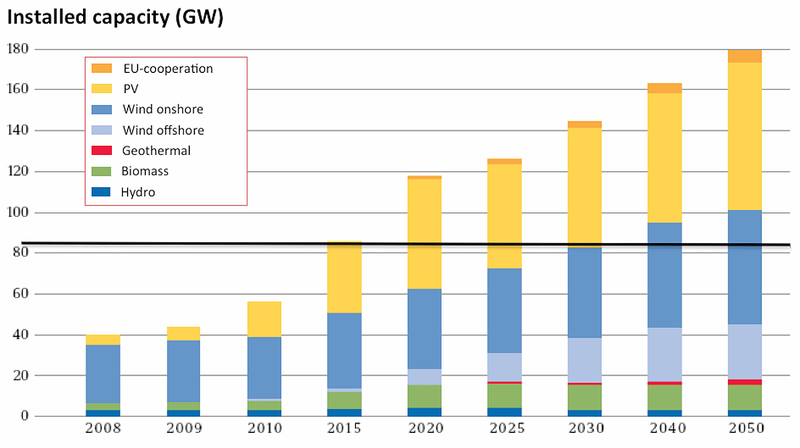 Third, conventional power from gas and coal is being pushed out of the market. This means that a lot of conventional power plants are largely standing idle and not making any money. Since the future business model for such plants is looking bleak, the power companies are sitting on investments, which are not going to be profitable. Of course, RWE and E.ON are adjusting their long-term strategies. This seems to be working. The surcharge for 2015 has been calculated at 6.17ct/kWh, which is a small decline compared to 2014. Politically, this may well have been a wise policy, as public support for the energy transition was dwindling. It means that green energy development will happen more slowly. So far the government appears to be standing by the same targets, perhaps because the explosion in development over the past few years had put it on an even faster track. Whatever happens from here, one thing remains key: without public support, the energy transition will not work.